All societies have their creation myths, Adam and Eve, Romulus and Remus and many others. But these myths are not limited to the ancient world, and capitalist society has its share of myth and mystification that are intended to legitimise the class rule of the bourgeoisie. For the Anglo-Saxon world and even beyond, Magna Carta serves this role; 800 years old last month we are told that it is the foundation of freedom, democracy and the rule of law. Unlike Adam and Eve and other fairy tales of ancient times, there is no doubt about the historical fact of Magna Carta. It was signed at Runnymede in June 1215 by a reluctant King John in the face of an uprising in London led by powerful barons who resented the Kings arbitrary imposition of taxes. So how has, what was in effect, a peace treaty to prevent a civil war between the monarch and the elite of feudal society, been elevated by people such as the founding fathers of the American constitution down to minor entities such as David Cameron, as the font of bourgeois liberty. We are told that the Magna Carta is the foundation of the 'rule of law', a concept close to the heart of the bourgeoisie. It's a term that can have several meanings but there are arguably two main ones. The first is that the rule of law is a euphemism for the rule of the law of property rights of the ruling class. Magna Carta purported to do this for the rights of the feudal barons, long before the concept became fetishised by the bourgeoisie. The second meaning concerns the idea that nobody is beyond the law, including governments, and of course in the time of Magna Carta, the monarch. So noble was this concept that within weeks of Magna Carta being signed, it was annulled by the Pope at the behest of the King John. Later, after more civil unrest, and after King John's death, Magna Carta was reissued by his son Henry III in 1216, and following further breaches it was issued again in 1217 and 1225. Even during the feudal period Magna Carta became an irrelevancy and was largely forgotten. Later on in the sixteenth century, in what was the dawn of the modern era the Chief Justice of England Edward Coke was dismissed from his post for claiming that the king, James I, was not above the law. Coke then wrote 'The Institutes of the Lawes of England' in which he claimed that Magna Carta was the basis of the English common law. This would appear to be the origin of the myth of the Magna Carta. In modern times, as in medieval time, the idea of the state being subject to the law is a constitutional myth. The big flaw in this article of bourgeois faith is that the state makes the law. It is true that in liberal democracies the courts do find particular actions of governments to be unlawful from time to time and sometimes governments accept the court ruling. If however the state finds the court ruling to be inconvenient, all they have to do is change the law. Another myth is that Magna Carta forms the basis of democracy because it created some sort of council of barons to keep a check on the monarch. Even in 1215 this was not a new idea. In the pre-Norman period, the Anglo-Saxon 'Witan', councils of 'wise men' were appointed to advise the monarch. And of course there was nothing remotely democratic about these institutions, even the idea of democracy did not really emerge before the English Civil War in the 17th century and it would be another 200 years before the British Parliament even remotely represented the mass of the population, and universal suffrage was not fully implemented until 1928. The next myth arising from Magna Carta is the idea that it established equality before the law. It talks about not denying, delaying or selling justice. A fine sentiment indeed, but rights were only ever intended for the landowning classes. The serfs who constituted a significant part of the population had no legal rights at all. In class societies the idea of equality before the law has little meaning. Equally laughable is the claim by some that the right of access to the courts and even to legal aid comes from Magna Carta. Tell that to the women who were put on trial for witchcraft, the peasants who were hanged for poaching or workers who were transported to Australia for petty theft. How grateful they must have been for the rights conferred on them by Magna Carta. The law is made in the image of the ruling class and in capitalist society this means the bourgeoisie. In liberal democracies, the law creates a semblance of rights for workers, but only insofar as they are not contradictory to bourgeois property rights. Also these so called rights are transient and can be rolled back when they no longer accord with the interests of capital. We have seen this clearly regarding the erosion of employment rights, benefit entitlements and civil liberties in recent years and the trend can only continue as the crisis of capitalism deepens. So when the Queen, David Cameron and the great and the good of the ruling class rocked up at Runnymede to celebrate Magna Carta's 800th birthday, you could be forgiven for thinking that they were not really celebrating 800 years of freedom, but 800 years of class oppression. Amongst the many strands of concepts in this article, as I see it, what emerges are questions about power and law and order today in Britain, in so far as those concern workers. Rightly or wrongly, I have been given to understand that, at one stage, workers were glad that the powers of feuding barons were reduced or curtailed, so that at least they could know who was boss, i.e. the king, so that workers wouldn't be so likely to be sent to kill each other within England. Whilst of course the law today is largely an inheritance from earlier property relations, it would not make sense to me for workers to abandon all support for 'law and order'. Without some sort of police force, how would workers' councils communities deal with threats to them of all sorts ? Both local and wider areas would need to be ready to tackle expected and unexpected problems which disturb the peace. After the revolution the workers disband the bourgeois police force, which is only there to protect and serve the interests of the ruling class and their property rights (oh I know T34 that from time to time the police may do something "nice" for the exploited too!) and set up instead proletarian militias of armed workers. Their job it is to protect the advance of the revolution itself against all those who remain fixated on the old idea of "everybody for himself", and the unhappy consequences which accrue from this, and rigidly maintain that life remains "the competition of all against all" despite the establishment of the new proletarian dictatorship. The new proletarian order will have to be enforced. By proletarians! Only as communist society in and for itself begins to be established and accepted generally by all the population will the proletarian militias of armed workers be disbanded. Bringing communism into being is a serious business. Charlie, surely it is mistaken to describe a police force itself as 'bourgeois' or 'proletarian', however much it is being used for one or other or partially for both classes. The notion of being able to just disband a 'bourgeois' one just after a revolution and immediately replace it with an untrained unknown 'proletarian' one is just fanciful. What is more likely to happen is that just after a revolution, with very mixed extent of 'popular' support, large sections of a population, unconvinced by propaganda which has argued for the 'necessity' of 'communism' to 'begin', will call for the police as then existing to protect them from 'rioting rabble'. Attempts to change the status quo overnight soon proove to be futile, as shown from 1917. In any case, human beings, as mammals, are territorial, by necessity and inclination. Home ownership does not only occur for those with mansions and palaces. The police are a bourgeois invention produced to protect bourgeois property rights under capitalism. So as there won't be any property rights after a successful proletarian revolution, the police will cease to be necessary. Those of them capable of embracing communism and of developing proletarian class consciousness will be welcomed into our class, but not the rest. The revolution is not built on the basis of bourgeois thought patterns, to which the police so happily commit and even embody, but on the basis of consciousness. Some other points arising from your post. (1) Communism isn't the product of propaganda but of class consciousness. Propaganda refers to the lies put about by the bourgeoisie to disguise the true nature of their exploitative economic system. (2) "rioting rabble" will largely be members of the petty bourgeois class (not workers as you might wish to imply T34) who will of course yearn initially for the return of the bourgeois police to protect their commodities, businesses and other possessions. This will not happen, and proletarian class conscious militias will have to calm these people down while attempting to educate them into a better way of seeing both a purpose to life and of living together. (3) Attenpts to change the status quo overnight won't happen because, like you, the class conscious proletariat knows this is impossible. It wasn't attempted in Russia in 1917 either. In Russia the revolution was waiting for similar uprisings in the rest of Europe. As Rosa Luxemburg pointed out: the big questions regarding how the revolution should best proceed could only be raised in Russia, not answered. (4) Generally speaking mammals are not home owners and the bourgeois obsession with it is only a passing fad for humanity, the result of this ruling class being besotted with "ownership" as a major sign of success in life. But proletarian consciousness is a vast leap forward compared to the mind-set of bourgeois childish and ideological thought, and the notion of "home ownership" - such a trivial way of evaluating a happy and fulfilling life - will quickly find its way to history's dustbins come the dawn of communism. Responding to Charlie's comments of 2015-07-12 05:01, here are brief comments, taken paragraph by paragraph. (1) So everything will be everybody's and anybody's ? (2) Class consciousness will arise without communist propaganda ? Then what are you doing ?! (3) Class conscious militias will calm people down ?! Re-educate them ? Living together ? That doesn't sound unlike red guards and gulags. (4) In the vast land of partly post-Tsarist 1917 Russia, can lack of success really be ascribed to lack of similar uprisings in the rest of Europe? Materially, what was lacking in Russia in 1917 ? Would Russian revolutionary workers (communists) only have been able to advance with their revolutionary intentions (if not plans) if revolution had occurred in, for instance, Germany and/or Britain ? No, Rosa's Trots gave an excuse rather than a valid explanation for adopting 'interim measures'. (5) If home ownership is destined for dustbins come the dawn of communism, how many workers will look forward to it ?! You may have the best of intentions, but what you need is critical path analysis, to determine what does and what does not make sense for workers. There are more things in heaven and earth than are conceived of in your confused leftist philosophy T34. But thank you for taking the trouble to reply. Can I make few inappropriate remarks about the photo at the head of this article? The gathered Establishment is clearly overjoyed by the celebrations for the phony achievements of Magna Carta, though they succeed in hiding it and looking as gloomy and solemn as ever, as if the stock exchanges have just fallen again and it's curtains for Europe. But, as PBD points out, this is really a celebration of class oppression so perhaps that explains the pervading gloom that dominates the participants. Or has someone broken wind? 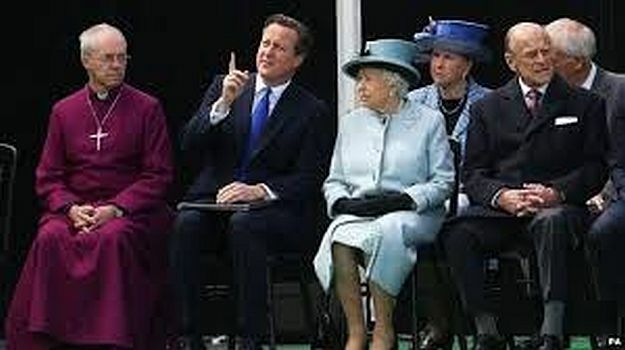 The Archbishop seems to think so, and even to know who it was, while David Cameron assures the queen it's really an act of God and can't be helped. The duke though catches a decorous whiff, recognises it and turns away pissed off as ever. Only her majesty remains unperturbed; though she had a bad night and doesn't feel her usual radiant self. Ah! The joys of being the ruling class! Enjoy it while you may however, the writing's on the wall. Charlie resorted to quoting Shakespeare and alleging that I had a 'confused leftist philosophy' rather than addressing the comments put to him. Never mind. Thanks for your "inappropriate comments" on the photo which was stuck there as a provocation for just such a response! Also thanks for tackling T34's confusions which seem to be no longer even "leftist". he has not grasped the point that the police are not class neutral but part of the capitalist state which employs them to ensure that their property is defended. He does not seem to see that the very process of revolution changes people (as Marx notes in the German Ideology) so what was considered normal in one society is no longer necessary in another. The same ahistoricism is present in his first post which equates feudal serfs with modern proletarians.They did not choose to follow a King against the Barons but had to accept whatever military overlordship was on hand at the time. It no accident that the Peasants Revolt does not take place until 1381 - i.e after the Black Death had substantially weakened feudal relations. The attempt by the Crown to re-assert these led to the revolt (the poll tax being collected twice being the final straw that broke the camel's back). Whatever the histories, the fact is that however the police today is led and used, the majority of its workers are employees. Of course those are used in such events as the miners' strike against the class from which they mostly come. Likewise, the armed forces are largely composed of workers, however much conditioned by bourgeois ideology. Obedience to orders tends to predominate. Whether today's police, soldiers, sailors and airmen can ever be persuaded to come over to the side of revolution needs to be considered, also in view of the general absence of weapons, and training in the use of them, by any recruits to an 'alternative' revolutionary militia and what might still be known as the 'peoples' police', if you'll excuse the expression ! Then again, come the revolution, if everything is deemed to be everybody's and anybody's, burglars and fences will be consigned to memory. Gad, where's the Domesday book ?! Oops, when I mentioned recruits, I meant any not from police and armed forces.